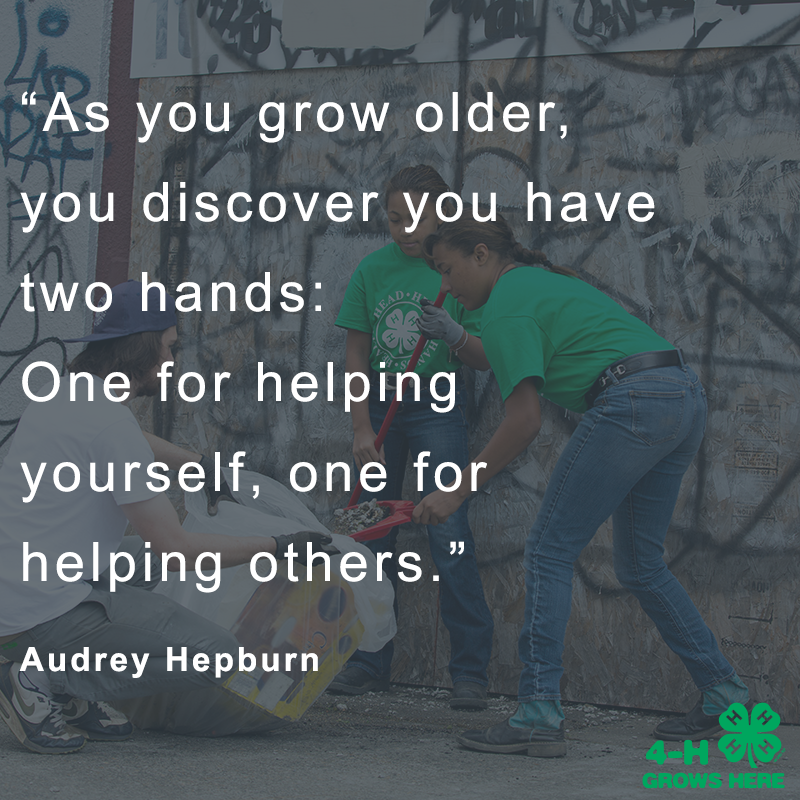 These are not just words of our 4-H pledge, they are reminders of a larger good we can do as a 4-H whole. One individual can inspire their club which can then in turn inspire a county…and so on. 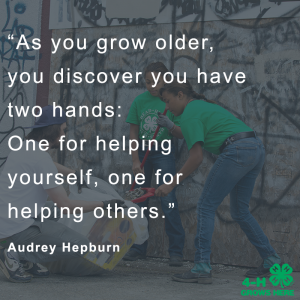 Routinely 4-H’ers help year round with numerous service projects such as clean ups, assisting the handicapped or elderly, toy drives, and food donations. However, Florida has many devastating events to call for a bring-to-action attitude such as fires, floods, and hurricanes. Only a few weeks ago the Florida panhandle was hit by Hurricane Michael. Many families lost everything and are still in need of hope. All across the state communities are banning together to help. 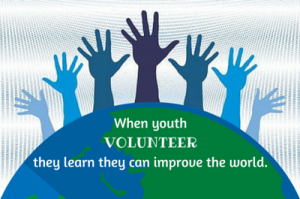 Here are some ways 4-H members and volunteers can help after any catastrophic event. Immediately after a disaster drives for goods are a great way to start. This can easily be done by setting up a drop-off area at your local Extension Office or Emergency Operations Centers. Reaching out to churches, businesses, grocery stores, and so on for donations can be accomplished easily throughout the area. Advertise when, where, and what you are collecting through social media, posters, newspapers and television will help spread the word. Keep similar items together and label everything. Time spent sorting donations takes away from time your donations could help someone. If you do collect goods it is key to establish a contact who can transport or distribute your donations. Always consider your time as the biggest needed donation. Seek out official groups coordinating relief efforts such as clean-ups, distribution, or soup kitchens. Always have someone in charge ahead of time and avoid just showing up. Your time is a wonderful donation so make sure you putting in the right places. By self-deploying without direction you may end up doing more harm than good. Initial help is always abundant but as the news changes many relief efforts dwindle. Many areas hit by disasters will be flooded with donations but have little help distributing them correctly. Many families will still need help rebuilding their lives, not just collecting goods. Always consider helping… even months after an event. Disaster relief is never accomplished in a week or two! 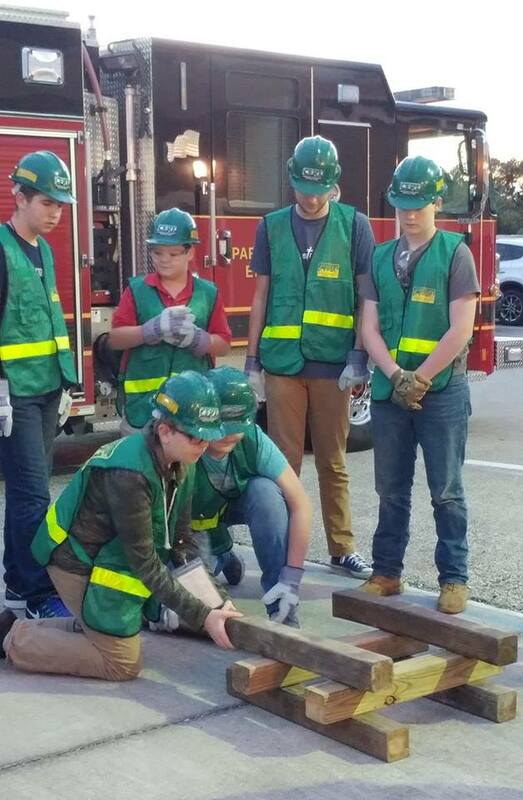 Youth Emergency Team members learning cribbing skills that are useful for search and rescue operations after emergencies. As a club, volunteers can help run soup kitchens and distribution centers for goods. They can offer clean-up assistance or volunteering at affected area animal shelters. Bathing animals, taking dogs for walks, playing with cats, doing laundry, and cleaning cages mean so much to both shelter staff and the animals in need. Sending thank you cards to volunteers and organizations stationed at the areas can also go a long way. Many agricultural families will need help rebuilding fences for livestock. Organizations and clubs can team up to organize trips to rebuild fences, clean up barns and homes, and so much more. Relief trips can be a day or weekend trip, or for as long as needed. There is nothing quite like lending a real helping hand. When in doubt monetary donations are easy and incredibly effective. You can not always anticipate someone’s needs so donating some money is versatile and appreciated! Donating directly to trusted organizations is the safest route. There are many preventative ways to help in critical times like establishing a Youth Emergency Team or Community Emergency Response Team. By using FEMA approved curriculum your communities can train up citizens to directly help during local crises. Skills learned include first-aid, animal sheltering and behavior, search and rescue, fire safety and suppression, and so much more. You can also check on neighbors or lead workshops on how to properly prepare your homes, livestock, and families for disasters.